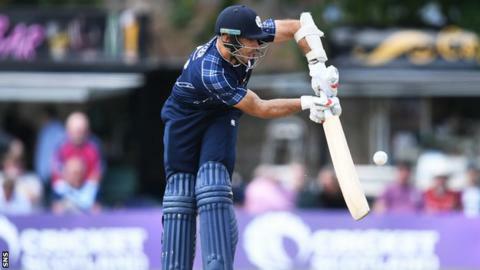 Captain Kyle Coetzer's century helped Scotland end their successful ICC World Cricket League Championship campaign with a 161-run win over Kenya. The Saltires sealed their place in the ICC World Cup qualifier on Wednesday. And Coetzer's men secured a second-placed finish in the championship with a dominant victory in Dubai. The fourth of the captain's one-day international career proved decisive after Matthew Cross, Calum Macleod and George Munsey made starts. Coetzer was dropped twice after reaching 50 in the 19th over but eventually fell for a match-winning 121 from 130 balls, with 10 fours and two sixes. He shared 87 for the fifth wicket with Craig Wallace - who hit 49 - as Scotland posted a daunting 266 for eight. They were immediately in the box seat with the ball as Safyaan Sharif took the early wicket of Gurdeep Singh in his 100th ODI before Alasdair Evans added Rushab Patel soon after. Dhiren Gondaria shone briefly, but four wickets for medium-pacer Chris Sole ensured they never got close to the Scotland total, eventually being bowled out for 105 in just the 34th over. Coetzer told Cricket Scotland's website: "The day's gone reasonably well. "My partners at the top helped get away a few boundaries at the start and we managed to set a platform. "We would have liked a few more, but we came up against some good bowling by Kenya. "We've got a great group of players here and people are striving to get better physically, mentally and technically as well, so we want to go and put pressure on these guys as we go into the World Cup qualifiers."